Counting my blessings – Modgam is turning 1! I have been feeling a lot the past few months, like a million zillion thoughts going through my head. I am a little overwhelmed but mostly thankful. I have been wanting to do a lengthy post about what I have been feeling since the day I’ve openly published my blog and I finally got down to doing this after having a nice chat with a sincere blogger friend when he sent me home. Time flies and by mid April 2013, Modgam turns 1!!! From zero subscribers to 100+ and 2 awards after a month old, I still cannot forget this surreal feeling and how grateful I am. I still cannot believe how many people are reading my blog and it really means a lot to me. Till date, Modgam has 920 subscribers since I openly published my blog 11 months ago!!!! THANK YOU so much! I have been blogging for a long time but only close friends read and knows about Modgam for it has always been a personal space for me to rant. My friends have been urging me to start a blog and share all my food joints, fun finds etc with everyone instead of just updating and sharing with my Facebook friends. I was thinking if I should open a new blog or stick to Modgam and the rest is history. Never in my dreams will I ever imagine that I will one day be sponsored by Shunji Matsuo, Luxewomen, BellaBox etc, working with awesome PR companies and be invited for media, beauty, food and fashion events. With that being said, I am not here to brag but am more thankful, grateful and blessed for the many opportunities given. I am not here to compete and sometimes even I myself am surprised when I receive calls or emails for invites or sponsorships from certain big brand names. Blogging has been my passion and I feel really good when sponsors, PR companies, friends, readers or anyone of you telling me how much they enjoy or love reading my articles. This means the world to me. Stay real, sincere and honest because in time, all will be revealed. That is kinda my number 1 rule. Being a blogger is not just about receiving and taking free food and products, there is NO such thing as freebies. The time and effort spent into each article with tons of picture editing and watermarking is a commitment. I look every bit the vocal and loud gal but I am infact very shy on the inside. Yes, I am quite the introvert and I spend most of my time at home if not at work, attending events or catching up with friends. I enjoy staying at home spending ME time with my best fur-friend, Goofy, blogging and shopping online. I love talking to people and meeting new friends but that doesn’t mean I am an extrovert. I cannot speak in public for nuts nor can I perform or go on stage and do an act or something. Ask my boss, my close friends or D and they will be able to tell you. Ask me to dress in all loud and weird fashion clothing and I’ll tell you to bring it on! Give me a curly wurly maggie mee perm and I’ll say why not! As long as I don’t have to expose my fats or any indecencies, I am all about venturing Fashion! I am just a friendly super-love-quirky fashion introvert? I don’t have a photogenic memory and if we meet in events or in public, do give me a shoutout and I’ll be sure to holla back. I am not arrogant but pictures can be deceiving so I might not be able to recognise you? If you are my readers or bloggers and you follow me on twitter or instagram, I will follow back to show my support. Especially if I know you are a blogger too, I will definitely follow back to show my support and to also make new friends but please don’t take it the wrong way if I don’t recognise you. If we have met and it slipped my mind, please accept my apology. I am only human. 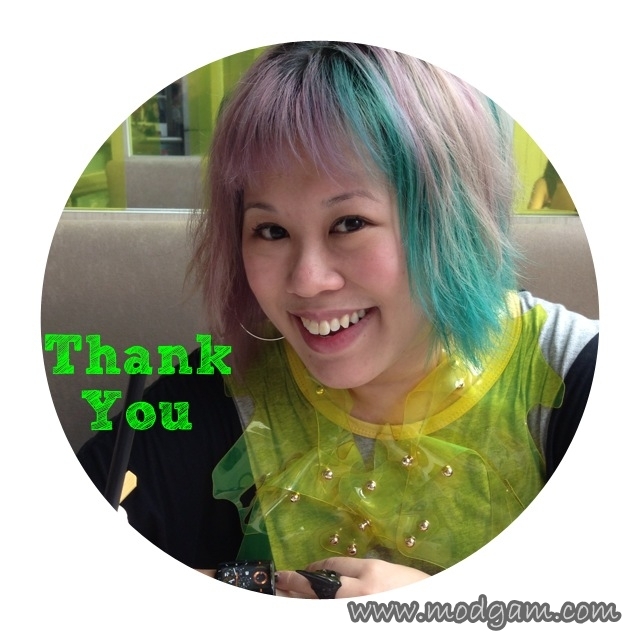 and thank YOU for an awesome blog! *SUPER HUG* Well done! Mag, we have not met yet, but I like your style. Stay cool ! we’re blessed we’ve known you, mag! congratulations to your fabulous blog! And thru blogging..I met you! and now u are my offline friend that i could even share my heart out. Bless u Modgam for bringing Mag to me. ahhaahah..